I can’t believe it, after over 30 or more years someone actually remembered the gig (see below). I’m Gray Smith who was the drummer in the band. It was about 1971 and we were all about 14 years old. We actually had access to the Scout Hut for about a week and we really had a freak-out in there. I can only remember 3 songs: Mushroom by CAN, Evil by Heimdall and some 12 bar space blues. I remember the dancers too, joss sticks and patchouli oil everywhere. 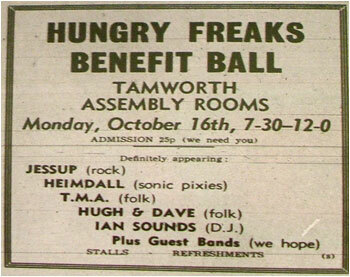 We also played Leyfields Community Centre and Tamworth Assembly Rooms before going separate ways. I was also the drummer in LUCIFER, FLASH HARRY, THE LOUNGE LIZARDS until my body got fed up of falling off the drum stool due to rather large amounts of a certain liquid. Hic…hic. Heimdall did a fantastic gig at 'Hopwas Scout Hut' and were very Hawkwind inspired. They had (from failing middle aged memory) Chris Gould, Clifford (Chippy) Chipman and Steve Owen as members. They had a following who did some 'Stacey dances' stuff but with clothes on i.e. headbanging/cosmic posing etc. The only song that I can remember was written by Chris Gould and it was called 'Witch Woman Reserat Lemtrac' or something like that and it was written about a friend of mine who was a goth before there were goths. I'd love to hear about Heimdall and if anyone has got any memories about that fantastic gig at the Scout Hut! The full profile and history of Heimdall has yet to be added to TamworthBands.com Call back soon to read the full band details.